The long search for truth, the tortuous journey from culture to culture, the perilous quest into realms few had ever glimpsed, much less ventured—L. Ron Hubbard’s most renowned lecture of all time, The Story of Dianetics and Scientology. And that’s only the first monumental lecture! Beyond is the epic view of Scientology—past, present and future. Beginning with the past, from his current vantage point of Clear, Mr. Hubbard looks back through each previous discovery all the way to the first Clears he made in 1947. What that revealed is the answer to the question: “What happened to the rest of the bank the moment they achieved Clear?” And if the question was startling enough, what the answer revealed was the solution for total stability. Here, then, is not only the discovery of what prevents a preclear from “erasing” his mental image pictures, but a revelation that quite literally answers what life was like at the moment of creation. All of which opened a new panorama of doingness, extending across every dynamic, and summed up in the phrase “Bring Order.” So, yes—while L. Ron Hubbard began with a monumental look to the past, by the time this Congress was over, it was the creation of a story that continues to unfold every day, The Future of Scientology and the Western Civilization. I’d like to tell you something of the story of Dianetics and Scientology—some things I’ve never confided to anyone before. It was 18 October 1958, in London’s Royal Empire Society Hall. And with those words, L. Ron Hubbard began what would become his most famous lecture of all time. For here was his personal account of the long journey to bring about a new state of being Man had dreamed of for over 2,500 years…a story that could only be told by the man who lived it…The Story of Dianetics and Scientology. As evident in Mr. Hubbard’s opening words, it was to be his most expansive statement to date on what motivated his quest to answer the riddles of Man. As for what prompted him to tell that story at this time and place, the first answer is obvious: Clearing. It had been over a year since his last appearance in England and yet what now made this achievement possible had in fact begun during that previous trip. For it was then he developed processes to reach any case (Control, Communication and Havingness—London Congress on Nuclear Radiation, Control & Health) which, in turn, had prompted his development of new ways to teach auditors (training drills—Freedom Congress), which revolutionized auditor training. But there was something more—and it had everything to do with why this was the time for that now legendary lecture. And while it may not be so obvious today, to those who were there, in 1958, it stood out like a beacon from the title alone: Dianetics. The answer was not erasure. 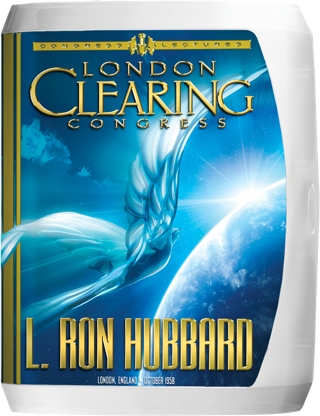 Rather, it was found in a word that marked the next great milestone of Dianetics and Scientology: Confronting. Moreover, that was only the beginning. Because capping it all, and extending to spheres far outside the auditing session, came the anatomy of confusion and order. It resolves the age-old riddle of creation, is the substance behind the motto “Bring Order” which now appears in every Hubbard Communications Office (HCO) and stands to this day as the guiding principle of what a Scientologist does. So yes, the London Clearing Congress was the right time and place. 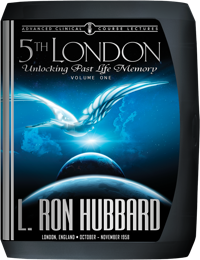 For while it began with the past, The Story of Dianetics and Scientology, by the time it was finished L. Ron Hubbard had laid in place an even more dramatic story, one that continues to unfold every day: The Future of Scientology and the Western Civilization.